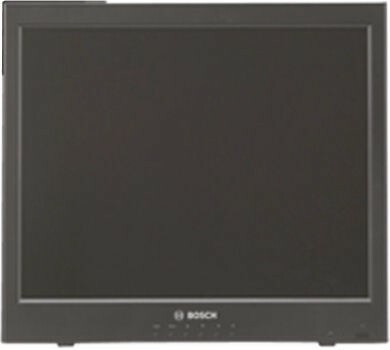 The Bosch family of high-performance LCD monitors are high-resolution (SXGA / UXGA), high-performance liquid crystal display (LCD) video display monitors. Available in an ergonomic and aesthetically pleasing design, these state-of-the- art monitors include a colour thin film transistor (TFT) active matrix LCD panel. Designed for the professional CCTV security marketplace, the Bosch High-performance LCD monitors include two looping composite video inputs, two looping audio inputs and one looping Y/C input. These monitors include an analogue RGB mode, a Digital DVI input, and an HDMI (high definition multimedia) input to accommodate the increasing use of PCs and digital video devices in security applications. To enhance the multi-input capability, the monitor includes a “picture-in-picture” function. This also enables any of the composite video or Y/C input to be inserted into the RGB/DVI/HDMI input display. A security officer can make standard adjustments to monitor display parameters with user-friendly choices displayed using on-screen menus (available in several languages) and front panel controls. For additional security, the monitor includes a front panel lockout feature that disables the front panel control buttons. Long-life fluorescent backlights maintain the monitor’s brightness level over time, because the LCD monitor design avoids the brightness degradation experienced with aging CRT-type monitors. This energy-saving technology also provides a sharp display, free of the annoying flicker prevalent in traditional CRT monitors, allowing longer use of your LCD monitor with little or no eyestrain. The monitors also feature an alarm trigger input providing the ability to switch input sources automatically. You can program the monitor to switch input sources and to sound a buzzer when it receives an alarm signal. In addition, the AutoSwitching feature lets the monitor cycle through selected video inputs. The versatile design allows these monitors to accept NTSC and PAL signal formats automatically as well as power supply voltages from 90 to 256 VAC. Compact styling makes the Bosch High Performance line the colour monitors of choice for large-screen, space constrained applications. With a wide range viewing angle, these LCD monitors may be easily viewed whether they are placed on a desktop, mounted to a VESA standard wall mount, or rack mounted in a standard EIA rack.